Pay online or cash in person upon pickup. If paying online, a confirmed US address is required. Full description and extensive image gallery below. For shipping quotes, click here to get a quote from uShip to save up to 75% on shipping. Actual images and updated tractor specs to be added upon project completion. Tractor has been disassembled, media blasted, epoxy primed, painted in automotive grade urethane, and then reassembled with stainless steel hardware and all new decals and seat. =>Also has new filters, fluids, and tune-up…ready to mow! From 1993 onward, a new generation of John Deere lawn and garden tractors ruled the turf. The popular John Deere 425 (1993-2001) is favored thanks to its more “modern” conveniences versus earlier John Deere garden tractor models. One of the major advantages to the Deere 425 tractors is that they have a foot controlled hydrostatic transmission versus the earlier series such as the 318 that instead featured a hand control on the dash. 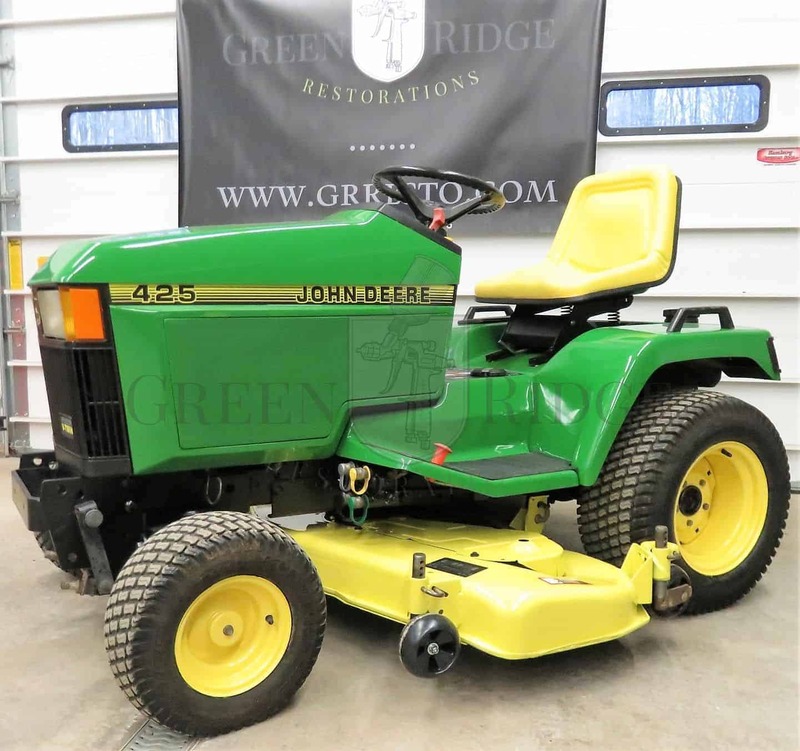 Learn more about the John Deere 425 right here. Payment is due in full upon pickup. We accept cash in person, or you can purchase directly on our website using any major credit card through Paypal (you don’t need a Paypal account to purchase). *We do not accept personal checks. Tractor is sold “as is, where is”, and is available for local pickup in the Buffalo, NY area. You may arrange shipping if desired, at your expense. Questions about sales tax? Please click the “Sales Tax” tab above. Because most of our buyers are not local to Western NY, they typically either work with a shipper local to their area or use uShip. Click here to get a quote from uShip to save up to 75% on shipping. ==>When you obtain a quote, your shipper may ask if a loading dock is present. We do not have one on site. We always recommend picking up large items such as lawn tractors using a trailer. !Loading a tractor into the bed of a pickup is never recommended – most larger tractors will only fit in a full size pickup, and even so, the deck must be removed since it will not clear the space between the wheel wells. Doing so raises the risk of undue scratches or other damages. New York State residents: We are required to collect New York sales tax. There are NO exceptions unless you provide us with a valid tax exemption certificate. 1- If you make your purchase (i.e. monies are exchanged and the item is picked up) here in NY, we are required to collect sales tax just the same as if you were to make a purchase at a retail establishment while visiting the State of New York. The only exception is if you provide us with a valid tax exempt certificate. 2- If you purchase online and the item is shipped/delivered outside of New York State, we are not required to collect sales tax.